The Annual Shoe Collection for Women & Kids in Need is Back! 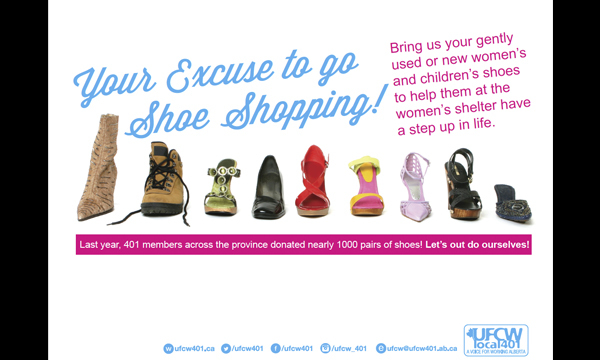 For the 3rd year in a row, the UFCW 401 Women’s Committee is spearheading our annual shoe drive where we ask people to donate gently worn or new women’s and children’s shoes for those in need. When women are fleeing dangerous situations at home, they often leave with only the clothes on their backs and their children in tow. In order to support these vulnerable women and children, a number of support systems are in place but they are often stretched to the limit. With oftentimes few resources, shelters and other places of support are in need of clothing and footwear for the victims of domestic violence who access their services. Last year we collected, around the province, nearly 1000 pair of shoes! We are hoping to beat that number this year! Please talk to your Rep about where you can drop off your donations of women’s and/or children’s shoes. Some workplaces will have boxes where you can drop them in to but if there is no box in your workplace, you can simply drop them off at your Local 401 union office. Deadline for donations is November 20th. We thank each and every one of you for anything you can do to support this campaign.